Nickname:"The Darlin' of Dublin", "Crafty Ken", "Ken-do"
Doherty has played his entire career with a warped cue randomly selected from the cue rack in his local snooker club, Jason's. Doherty humorously revealed that the club manager originally wanted £5 for it but Doherty haggled him down to £2. Ken Doherty explains, "It's warped. I must be one of the few professionals playing with a warped cue, but I wouldn't dream of changing it. I have got used to holding it in a certain way, with my eye trained on a piece of grain. 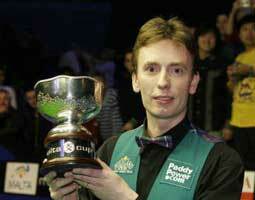 Doherty made a 147 break in a public exhibition in Ireland, in 2002. He made light of his prize on television shortly afterwards, which was allegedly Euro300, a BMX bicycle and a toy Ferrari car. In May 2007, Doherty appeared on RT? 's spoof show Anonymous, heavily disguised as a priest. Ostensibly he was a beginner at snooker and received some tips from Alex Higgins, who was initially fooled by the make-up and Doherty's hopeless play. However, as "Fr Donoghue" began to clear the table, Higgins' suspicions were aroused and Doherty was eventually rumbled. Still, Doherty's disguise was enough to fool his mother and wife.